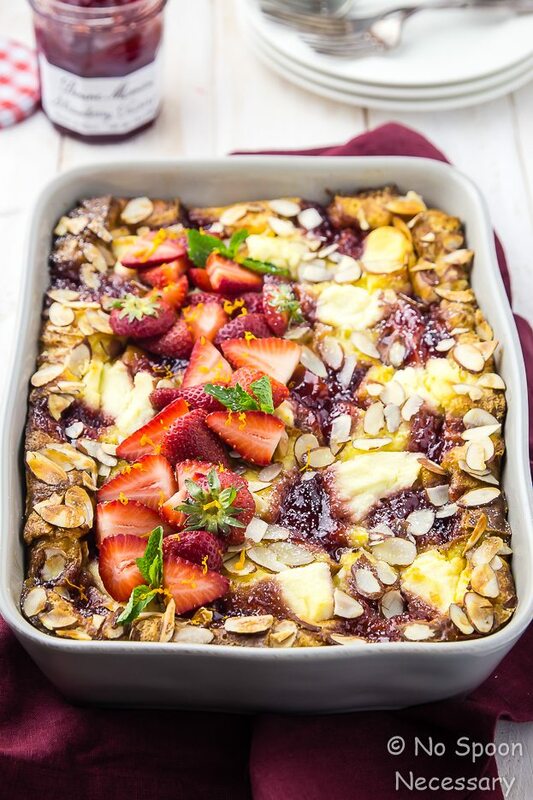 This Overnight Strawberry Ricotta Breakfast Strata is easy enough for breakfast, brunch or dinner, yet elegant enough for Mother’s Day entertaining. 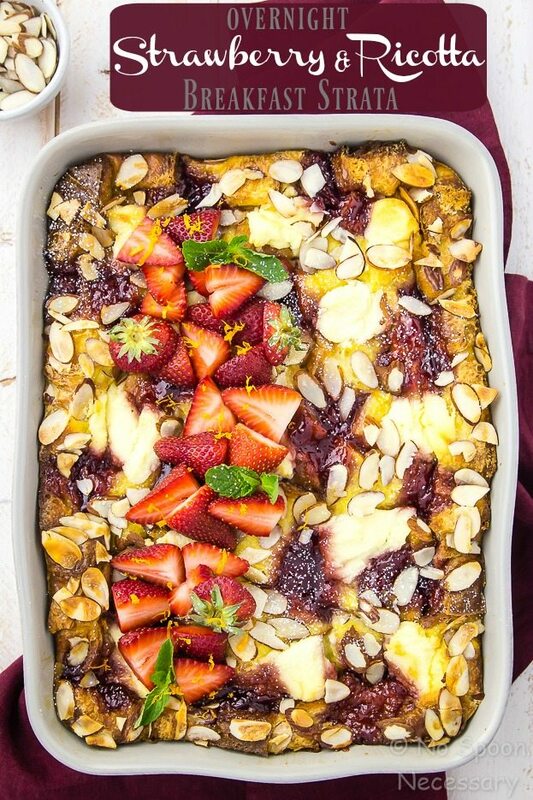 Jam packed with buttery brioche bread, fluffy eggs, creamy ricotta and sweet strawberry preserves, this strata is sweet and savory breakfast perfection! My fabulous mother unfortunately lives a few states away, and while I won’t be able to show her how much I unconditionally love, admire and respect her this upcoming Mother’s day, I am hoping she knows how much I care! Aaaand, I hope she knows if we lived closer I would be over making her breakfast in bed. Complete with carafes of Mimosas. Because what mother wouldn’t want THAT? In case you are still on the fence, and wondering how to spoil your mom on the upcoming holiday, I highly suggest you steal my idea. You should ABSOLUTELY make her this easy, yet elegant strata. And then deliver it to her while she is still cozy and curled up in bed. <– But, don’t do that in the middle of the night or anything weird. You won’t get bonus points if you actually wake mom from her Sleeping Beauty-like slumber with breakfast in bed. But, definitely do NOT forget the mimosas or the bloody marys! 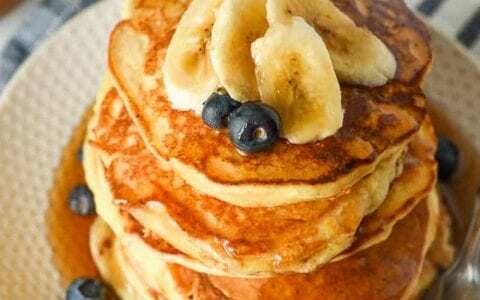 You DO get bonus points for bringing brunch WITH cocktails. 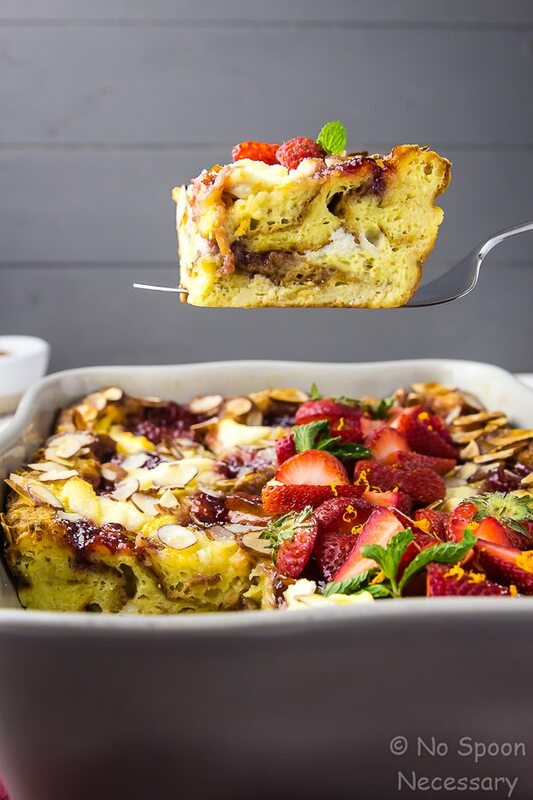 This layered casserole is loaded with silky, savory eggs, fluffy, buttery brioche bread, and studded with decadent, creamy ricotta and sweet, sticky Bonne Maman Strawberry Preserves. 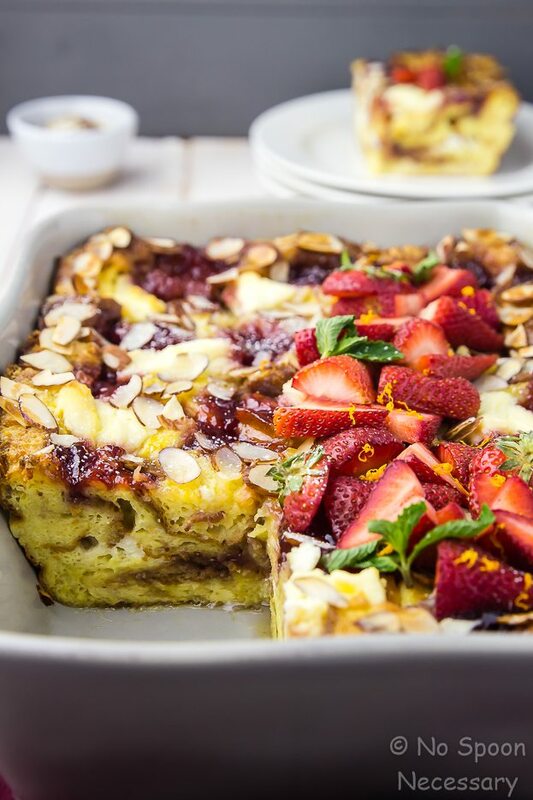 Generously garnished with crunchy, salty slivers of almonds; slices of juicy strawberries and cooling, fresh mint, this strata is ULTIMATE in the brunch department. Luscious, light and fluffy, yet thick and creamy with toasty-crisp edges, the consistency and texture of this strata is similar to a soufflé… MINUS all the laborious work and worrying. 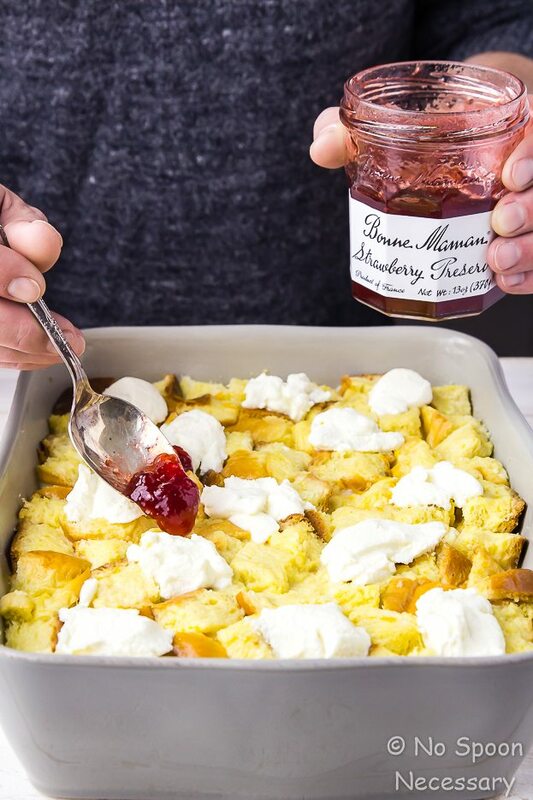 The star of this showy sweet and savory strata is most definitely the Bonne Maman preserves. Bonne Maman only uses natural ingredients and features the finest quality fruits in their preserves and jellies. They are Non-GMO Project Verified, have no high fructose corn syrup, no artificial coloring, AND zero additives. Bonne Maman preserves are simply made from wholesome ingredients that can be found in anyone’s pantry. 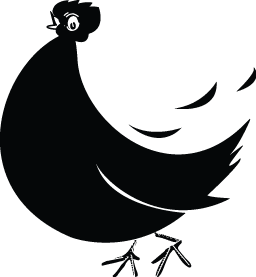 Basically, their commitment to deliciousness and homemade taste makes Bonne Maman my trusted brand of preserves. And, since we wouldn’t want to do brunch like anything but a BOSS, Bonne Maman preserves are a MUST. 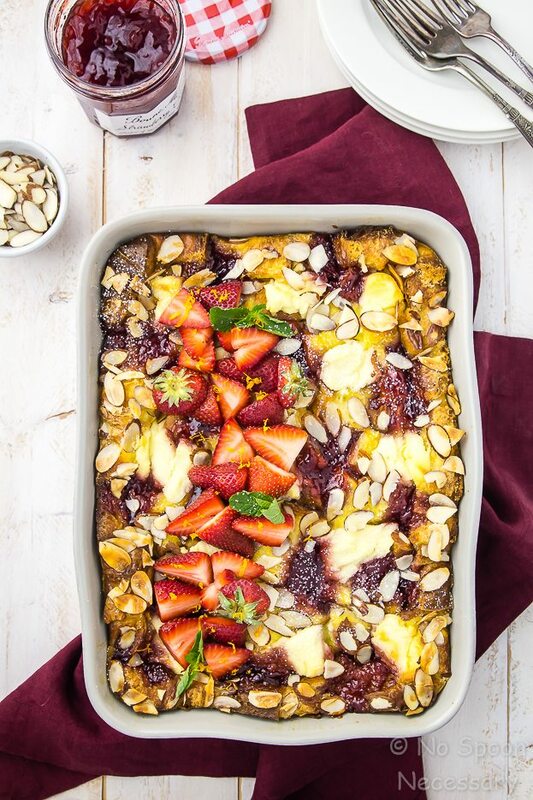 Because Mother’s Day brunch should be fancy, but not demanding, this sophisticated looking strata is easier than pie to prepare AND can be made in advance. First, you cube some brioche bread and place half of it in a greased baking dish, making sure you arrange the bread to cover the bottom of the dish. Next, you whisk together some eggs with a bit of milk, vanilla extract and orange zest. Then SLOWLY, and EVENLY, pour half of the egg-milk mixture over the bread in the baking dish. And then dollop half of the ricotta over the egg soaked bread, followed by half of the Bonne Maman preserves. 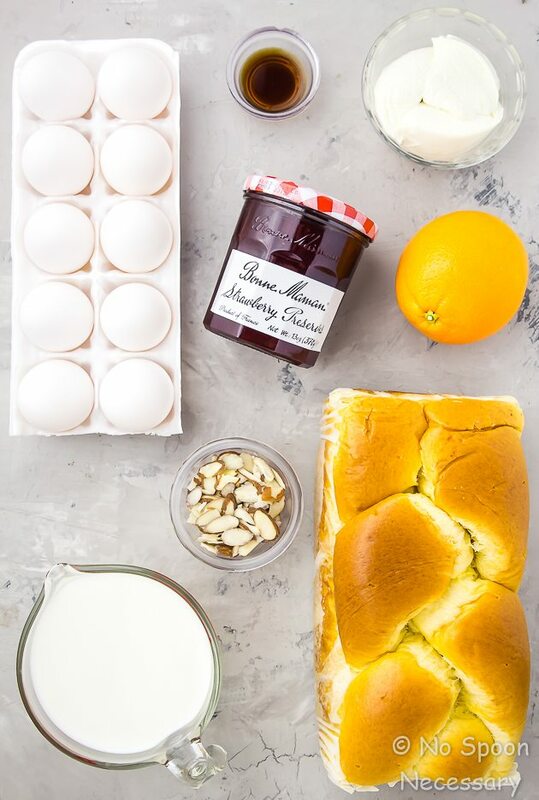 Repeat the process with the remaining bread cubes, egg-milk mixture, ricotta and preserves. Cover the casserole tightly with aluminum foil and transfer it to the refrigerator. Now go about your life. Pour yourself a glass of wine, make the kids some dinner, or write a Mother’s day card for your mom. Whatever’s clever, you guys. Just do you and have a good night. In the morning, pull the strata out of the refrigerator and let it sit on the counter while you preheat the oven. 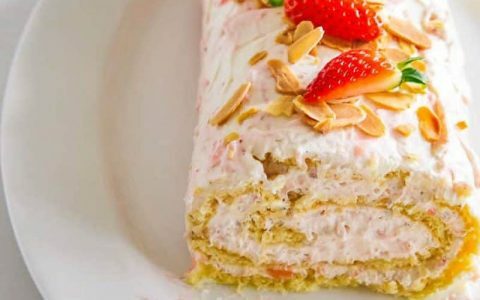 Uncover the strata, brush it with a few splashes of cream and generously sprinkle on some almonds. Transfer the strata to the oven and bake for about 55 minutes, or until the strata is puffed, golden brown and the center is set (it shouldn’t be jiggly when shaken). Go pour you and your mom a carafe of mimosas and surprise her with breakfast in bed. Then give yourself a round of applause. You have officially just become the golden child of the family. Bake, UNCOVERED, for 55 minutes – 1 hour, or until the strata is puffed, browned and the center is set (it shouldn’t jiggle when shaken)*. Remove from oven and set aside to cool for 10 minutes before serving. 1. While I recommend brioche bread for this strata, you can use any bread you would like. For the most luxurious, rich mouthfeel I suggest a buttery yeast bread similar to brioche, such as challah. But potato bread or Hawaiian rolls would work too. 2. You need stale, day old bread for this strata. 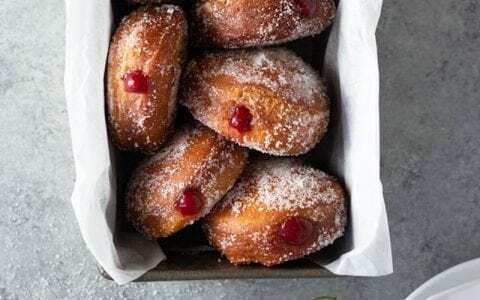 Fresh brioche bread will completely disintegrate into the egg and milk mixture. However, if all you have is fresh bread, do NOT worry! 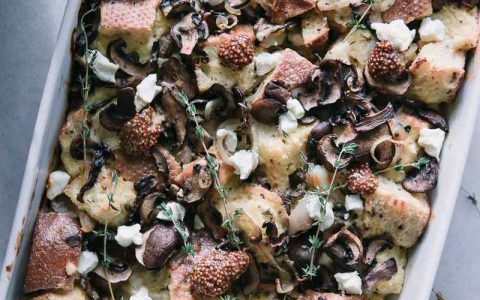 You can just toast the bread to get the same results as stale bread. 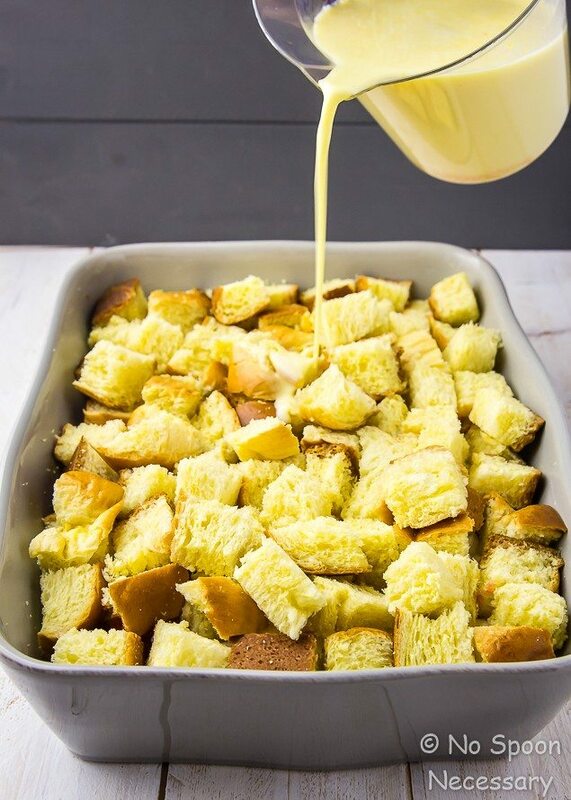 Place the cubes of bread on a sheet pan and toast them in a 250 degree F oven for 5-10 minutes, or until the cubes are just barely starting to crisp on the outside. 3. If you don’t care for ricotta, you can easily substitute goat cheese in an equal amount. 4. 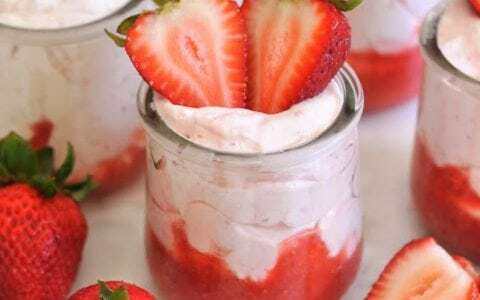 If you want a pretty design on top of your strata, you can use a butter knife to gently swirl through the ricotta and preserves to create a pattern. 5. For the BEST flavor and results, refrigerate the strata, covered tightly, overnight. Giving the bread time to really soak up the egg mixture makes a world of difference. 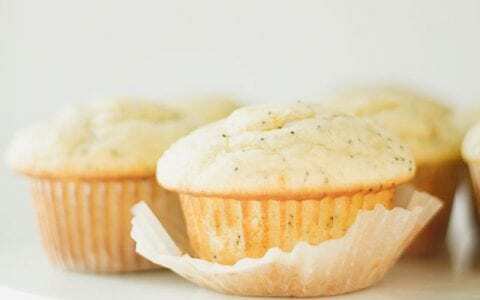 Nevertheless, you can bake it the same day if needed. Just make sure you let the strata sit on the counter for at least 30 minutes to soak up some of the flavor while the oven preheats. 6. If the top of the strata is browned to your liking before the center is set, tent the top of the baking dish lightly with aluminum foil during the last 10-15 minutes of cooking. Can leftovers be frozen? 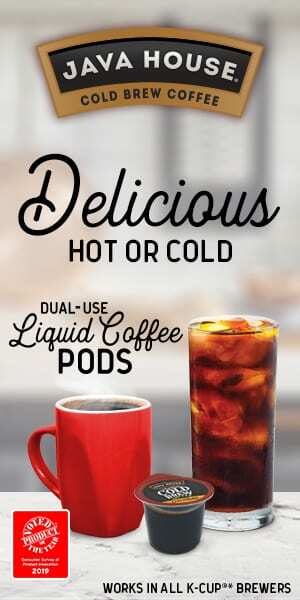 Possibly, thaw overnight in the fridge and microwave for a minute in the AM?